DiGiorno is famous for its TV commercials featuring the tagline, "It's not delivery, it's DiGiorno!" but a new viral video has many questioning whether the frozen pizza brand does in fact deliver ... to a popular pizza chain! A video posted to Twitter on Saturday purportedly shows a woman with a large cart filled with DiGiorno frozen pizza boxes — and she's standing at a Little Caesars' shop counter. 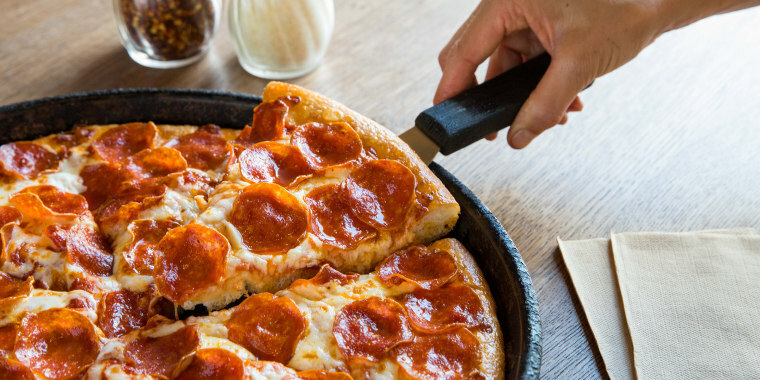 Naturally, the unusual circumstance has prompted a lot of questions (the original video has over 41,000 retweets and was shared by model-turned-cookbook author Chrissy Teigen), most important of which is was the "Pizza! Pizza!" chain actually serving DiGiorno? "This can’t be happening right in front of me,” Twitter user vinandwesson captioned the original video. So why, exactly, would a pizza restaurant have boxes of frozen pizzas from another brand at the ready? It’s like when I caught Granny Smith baking Sara Lee Apple Pie and saying it was home made! Of course, DiGiorno is pretty beloved so some took the opportunity to throw a little shade at Little Caesars. “The only Little Caesars I wanna go to,” Teigen tweeted out, along with the original video. DiGiorno told TODAY Food that they have no idea what's really going on in the video but appear to be delighting in the new attention on social media, responding to many people on Twitter. So is this really the biggest scandal to hit the pizza world since, well, ever? Little Caesars actually had a perfectly reasonable, albeit pretty complicated, explanation for the whole situation. For context, a spokesperson from the chain explained to TODAY Food that the Little Caesars seen in the video is actually located inside a K-Mart superstore in Griffith, Indiana. "Little Caesars only serves freshly baked pizzas made from fresh dough. After some investigating today, it turns out that what appeared in this video was a funny coincidence," a representative from the chain told TODAY. "On that day [Saturday], this K-Mart received a few complaints from customers about having purchased expired DiGiorno pizzas from that location and because it was so close to closing time, the K-Mart manager directed his employee to temporarily store them in a cooler adjacent to the Little Caesars location for disposal in the morning." While that would certainly explain the mixup, it's unlikely that fans of DiGiorno (or the brand itself) are likely to forget about this video anytime soon.